Relay fits CADILLAC ALLANTE 4.5 89 to 92 LQ6 Bosch. CADILLAC ALLANTE Convertible 4.5 Convertible Petrol 10/1988 09/1992 FWD 16 204 150. Function Relay, ABS. Model year from: 09/1989. Applicable Vehicles. REMOVED FROM CADILLAC CTS 2.8 PETROL,5 DOOR,2005 YEARS,215 BHP,AUTOMATIC GEARBOX,PAINT IS BLUE. MY AIM IS TO MAKE SURE YOU ARE ALWAYS 100% HAPPY! WHAT YOU SEE IN THE PICTURES IS WHAT YOU WILL RECEIVE! Part no 9142430. Alternative no D1768. Chevrolet, Pontiac, Cadillac models 1957 to 1972. Corvette Automatic Transmission 1956 to 1960. Cut Out Relay. Neutral Safety Relay. 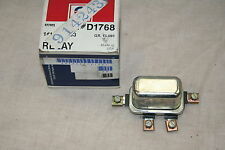 NOS, OEM, Part Number GM 1613715, Grp 9.647. Antenna Relay. 1977 - 1979 Cadillac. FAIRTHORPE Electron. Electron Minor. 12v Indicator Flasher Unit. REPLACES LUCAS 35020 SFB105 Units. It should not be altered / tampered with/used. Check out the. ~looks like the original~. Audi A6 4A, C4 [1994-1997] Saloon 2.0 16V (1984ccm 140HP 103KW Petrol). Audi 80 8C, B4 [1991-1996] Estate S2 quattro (2226ccm 230HP 169KW Petrol). Engine Code: ADU. Audi 80 8C, B4 [1991-1996] Estate RS2 quattro (2226ccm 315HP 232KW Petrol). PORSCHE 111953227D, 1H0953227, 91461830311. Model year from: 09/1994. VAUXHALL CORSA Mk I (B) (S93) 1.5 D Hatchback Diesel 12/1992 12/1996 FWD 8 50 37. Model year to: 08/2000. VAUXHALL CORSA Mk I (B) (S93) 1.4 i S Hatchback Petrol 03/1993 09/2000 FWD 8 82 60. Brand KOVO Warranty Yes MPN 90491314, 4RD007794-05 Interchange Part Number 90543014, 90 543 014 Other Part Number 90 491 314, 4RD 007 794-05, 5318C3, 5356C3 Pin?Counts 5-Pin Manufacturer Part Number Does not apply. Cadillac Multi Purpose Relay. Pontiac Buick. Chevrolet GMC. Flasher Unit. Belt Tensioner Wheels & Bkts. Suspension Ball Joints. Rear Lights. Front Exhausts Cats. Estimates can be provided beforehand but prices may differ upon ordering. The compatibility is only a guide. Abs Sensors. Clutch Kits. Belt Tensioner Wheels & Bkts. Brake Callipers. Brake Discs. Brake Master Cylinders. Brake Pads. Suspension Ball Joints. Automotive Relay with Wiring Harness and Socket 12Volt 30A 40A. 1 X Automotive Relay. 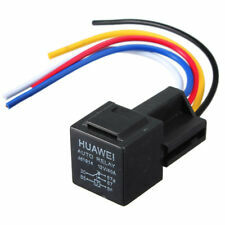 They can be used in conjunction with a switch or using any 12V or - trigger. A trigger can be anything from the accessory or ignition circuit to a switch which provides a positive or negative trigger. Max switching Current: 120A (5ms). Max Switching Power: 2000W. Heavy duty make or break (on/off) relay Ideal for universal 12V applications. Mix Release (VDC): 1.2~3.6. On Both Ends of The Coil Can Drive Resistance, or Protection Diode. 85: Connected to the ground chassis. √ Built in fuse socket with included 30A blade fuse, Space and Money Saving! 30A ATO/ATC Blade Fuse, 5-Pin Bosch Style SPDT Relays with 14AWG Hot Wire. 3D Full Surrounded Linen Pu Leather Standard 5-seat Car Seat Cover Cushion Set. Heavy duty make or break (on/off) relay Ideal for universal 12V applications. Max switching Current: 120A (5ms). Max Switching Power: 2000W. On Both Ends of The Coil Can Drive Resistance, or Protection Diode. Coil Inductance:0.8H. 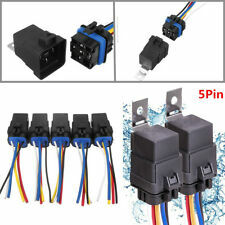 5 Wire Relay Socket Wiring Harness. 1X 5 wire relay socket wiring harness. Heavy Duty 16 Gauge Harness. Coil Resistance:90 Ohms. Air Ride Suspensions, Fans, Air Horns, Car Alarms, Remote Starts and so much more. 85: Connected to the ground chassis. 30A ATO/ATC Blade Fuse, 5-Pin Bosch Style SPDT Relays with 14AWG Hot Wire. 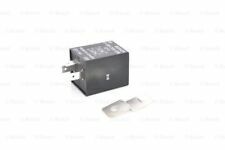 √ Built in fuse socket with included 30A blade fuse, Space and Money Saving! - 86: Connected to a positive 12V DC input. Manufacturer Part Number 30 91 1574. Rated Power [W] 21 W. Use engines info and vehicle YMM compatibility chart for general guide. Strictly important to provide VIN along with your detailed request since there can be different options for your car specific tech characteristics. Rated Power [W] 21 W. Will this item fit your vehicle?. Use engines info and vehicle YMM compatibility chart for general guide. Strictly important to provide VIN along with your detailed request since there can be different options for your car specific tech characteristics. HORN RELAY 1974/1999. BUICK 1976-1998. CADILLAC 1977-1986. PONTIAC 1976-1999. GMC 1974-1996. Parts are proven to be fully functional but you should expect normal wear and tear. Teile sind nachweislich voll funktionsfahig zu sein, aber Sie sollten normale Abnutzung erwartet. Sie mussen davon ausgehen, dass der Teil, den Sie von uns erhalten werden, wieder aufgespruht werden konnen. LUCAS ELECTRICAL SFB162, 15 FL. Model year from: 09/1994. VAUXHALL CORSA Mk I (B) (S93) 1.5 D Hatchback Diesel 12/1992 12/1996 FWD 8 50 37. Model year to: 08/2000. VAUXHALL CORSA Mk I (B) (S93) 1.4 i S Hatchback Petrol 03/1993 09/2000 FWD 8 82 60. VW GOLF Mk III (1H1) 2.8 VR6 Hatchback Petrol 01/1992 08/1997 FWD 12 174 128. Model year from: 09/1994. VAUXHALL CORSA Mk I (B) (S93) 1.5 D Hatchback Diesel 12/1992 12/1996 FWD 8 50 37. Model year to: 08/2000. Model year from: 09/1994. VAUXHALL CORSA Mk I (B) (S93) 1.5 D Hatchback Diesel 12/1992 12/1996 FWD 8 50 37. Model year to: 08/2000. VAUXHALL CORSA Mk I (B) (S93) 1.4 i S Hatchback Petrol 03/1993 09/2000 FWD 8 82 60. SAAB 4069985 8583627. VAUXHALL CORSA Mk I (B) (S93) 1.5 TD Hatchback Diesel 03/1993 10/1996 FWD 8 67 49. Model year from: 09/1994. VAUXHALL CORSA Mk I (B) (S93) 1.5 D Hatchback Diesel 12/1992 12/1996 FWD 8 50 37.